TRADE CANVAS ART CUSTOMERS EXPECT EXTRA BOUNTY! Are you a Star Wars fan? Had a favorite character as a kid? Usually figuring highly in peoples top ten comes Boba Fett, the mysterious jet packed bounty hunter that features in two of the original (and best!) Star Wars films. Hes the dude that caught Han Solo and arranged his carbonite deep freeze for Jabba. A 'trade' canvas art customer called us a while back with a challenge ... he had booked the actor Jeremy Bulloch (the man behind the mask) to come to his store, meet Star Wars fans, and sign merchandise. Our customer thought it would be great to have some quality Star Wars canvas art prints he could then ask Jeremey (politely!) to sign. We supplied a number of professionally designed canvases at a great price... and we are told lots of Star Wars fans went home very happy! (I wonder how much they fetch on ebay?) Heres Jeremy to the right, signing our quality retro canvas art prints. The moral of the story is... if you want to buy canvas art in quantities over five, then contact us as we pride ourselves in having the flexibility to do you a great price deal. 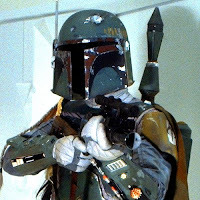 PS - Heres a link that proves that fella above really is Boba Fett!